How do I add multiple SMTP Servers for use by SQL-RD schedules? You can set up a number of SMTP servers and select from the list of existing servers when creating schedules. You can also set some as "backup" servers to be used when your "primary" SMTP server is unavailable. You can set up a number of SMTP servers and select from the list of existing servers when creating schedules. This allows you to use a different SMTP server for each schedule should you wish. This is useful if you want the "From" name and email address to be different for different recipients. A "check" indicates that this server has been selected as a backup server. If the selected server fails, SQL-RD will attempt to send the email through the backup server instead. If there is no backup server selected, SQL-RD will continue to re-try the email (See "Retry Failed Mails") using just the server which has been selected for that schedule. As stated above, you can set this account to be a backup email server. Click Test to confirm that the settings are correct. In any schedule in Email Destination, you can customize the sender’s details. 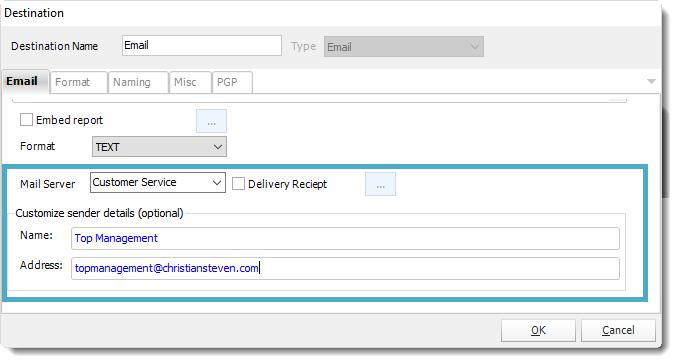 Rather than the email appearing to come from a SQL-RD user, it can appear to come from any individual you desire. Mail Server to use an added SMTP account simply select it from the drop down box.